Private transfer from Puerto Natales to Puerto Consuelo where our water taxi will be ready and waiting with all the equipment prepared. After a group meeting and safety briefing where we will familiarize ourselves with the equipment and paddling technique we will board our water taxi and navigate out into the Canal de las Montanas, sailing towards the Santa Maria Canal. Along the way we will be able to see 'Conjunto La Paz' (group of white mountains) and Burney Volcano, the southernmost mountain volcano in South America. On entering the Santa Maria Canal we will anchor in front of the Zamudio Glacier and get into our kayaks for a paddle up to this impressive wall of ice. Approximately 20-30 km paddling. 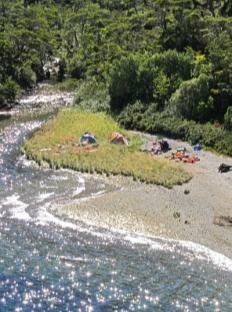 Night camping at the Morla Vicuna Channel. After breakfast we will prepare our equipment and begin to paddle across the canal with the view of Bernal Glacier and the Sarmiento Mountain Range. We will then reach the entrance of the Cormorant Sanctuary where bird life is abundant in this narrow passage where the glaciers are literally hanging from the cliff rocks. Once we approach the Bernal Glacier we will hike closer to the glacier in the company of our knowledgeable guide. Back in our kayaks we will paddle further into this passage passing between small icebergs while admiring the view of Glacier Hermann with its vibrant blue tones and huge shards of ice. We will approach the moraine which today is covered by water. We will look for a good spot to have lunch and take some photos whilst admiring the beauty and tranquility of this environment and the privilege of being in such a dramatic landscape. Approximately 20-30 km paddling. Night camping at Bernal Glacier. All meals included (with wine at dinner). After breakfast we will navigate towards our next adventure within this canal. We will anchor our boat near to Glacier Alsina and prepare to kayak in the bay of this glacier, after which we will paddle towards Glacier Paredes Bay. Once we enter the bay we are surrounded by tall cliffs (therefore enjoying some protection from the weather) we will continue until we see one of the walls of this imposing glacier, a truly unforgettable experience. We will look for a place to have lunch and rest before continuing our paddling through one of the most incredible scenes in all of Patagonia. Approximately 20-30 km of paddling. Night camping at Paredes Glacier. We will have breakfast and then paddle towards the end of the Canal de las Montanas to enjoy more magical views on our last day before we head back to Puerto Natales. 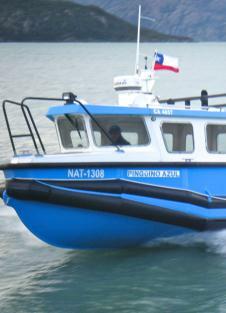 The water taxi will take us back to Puerto Natales where we will arrive in the late afternoon. Transfer back to hotel in Puerto Natales (we can book nights here on request).